Care to guess what is the best performing major currency in 2018? Chances are you will say that it’s the US Dollar. Although US Dollar is doing pretty well this year, the best performing currency is in fact the Japanese Yen. You can see in the table below that despite the Dollar Index rallying 4.9% as of Dec 27th, the Yen has outperformed the U.S Dollar by 1.43%. We can also see the U.S. Dollar has rallied against all the other major currencies, but the Japanese Yen has rallied even at a greater percentage against the same currency. For example, EURUSD has dropped 5.08%, meaning that U.S Dollar has rallied 5.08% against European Dollar this year. However, EURJPY dropped 6.5%, which means that Japanese Yen has rallied at a greater percentage against the European dollar. The market as always is a discount mechanism and it discounts events several months and years in advance. The BOJ (Bank of Japan) has embarked in a massive quantitative easing since 2013 and it’s the only major central banks that still maintains the program. The Fed has started to unwind the quantitative easing and normalize the balance sheet while the ECB has stopped the program. BOJ is caught in a conundrum. The 2% inflation target remains as elusive as ever, and the recent selloff in Oil should further damp the outlook. BOJ Governor Haruhiko Kuroda admitted that BOJ must weigh in the negative cost of prolonged monetary easing. For example, it can hurt financial institutions’ profits and discourage them from boosting lending. The change in attitude underscores the rising hurdle for meeting BOJ’s price goal. Minutes of the October rate review shows a rift within the BOJ as board members disagree on the prolonged easing. Last month, Kuroda also said that Japan no longer needs to “decisively implement a large-scale policy to overcome deflation.” This is perhaps the most specific hint that BOJ is preparing to exit from the most aggressive quantitative easing experiment. Couple this with the Fed’s rate hike path running out of steam, the Yen likely can continue to get stronger in 2019. This is the scenario where BOJ reduces stimulus as the Fed pauses. An anticipated end to BOJ’s negative interest rate policy in 2019 should make the yen more attractive. Below we will take a look at Elliott Wave outlook for two Yen crosses: GBPJPY and EURJPY. We will check to see what the technical tells us about the outlook for Yen pairs in 2019. GBPJPY Daily Elliott Wave chart above suggests that cycle from 2.2.2018 high shows an incomplete bearish sequence towards the target of 129.1 – 133.06. This view is valid as far as pair remains below 9.21.2018 high (149.78) which is the invalidation level. 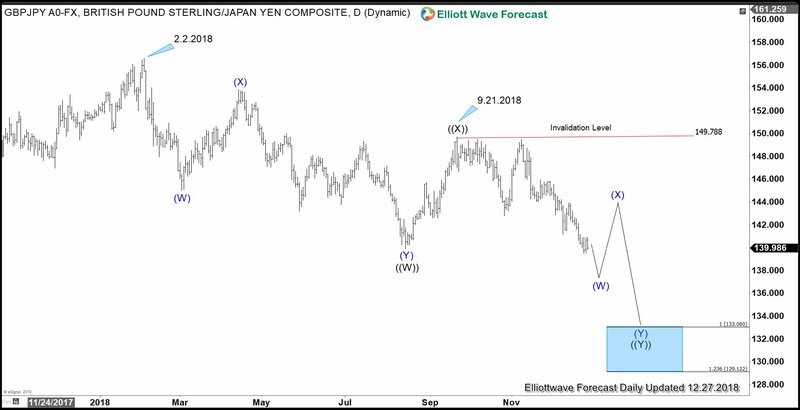 The decline from 2.2.2018 high is a textbook 7 swing double three Elliott Wave structure (WXY) This chart confirms that Japanese Yen will continue to outperform against Pound Sterling in 2019. CADJPY Daily Elliott Wave chart above also shows that cycle from 9.15.2017 high shows an incomplete bearish sequence towards the target of 75.49 – 78.11. This view is valid as far as pair remains below 10.3.2018 high (89.18) which is the invalidation level. The decline from 9.15.2017 high is also 7 swing double three Elliott Wave structure (WXY). The first leg Primary wave ((W)) unfolded as a Flat Elliott Wave structure (A)-(B)-(C) with 3-3-5 structure. This chart confirms that Japanese Yen will continue to outperform against Canadian Dollar in 2019. 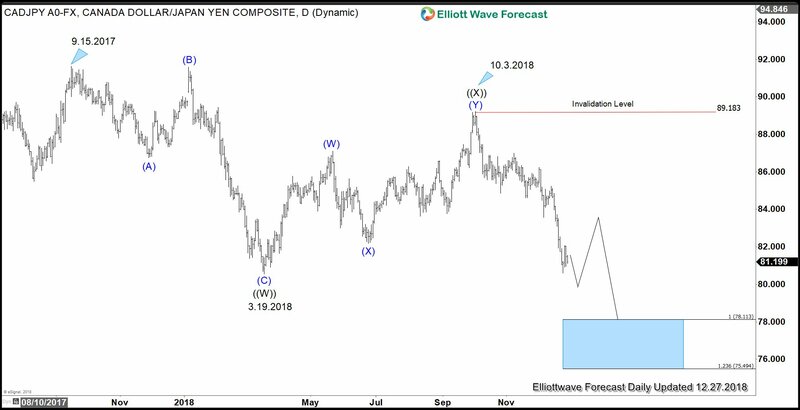 In conclusion, both GBPJPY and CADJPY Elliott Wave outlook confirms the thesis that Japanese Yen can continue to outperform. The market price action has spoken and the current strength in Japanese Yen discounts the future in which BOJ reduces stimulus and the Fed pauses the rate hike.